Wedding socks are a great seller on the shop because they are practical, affordable and reusable. Plus, they make for a photo prop when the wedding photographer takes some snaps of the groom and his crew getting ready for the big day ahead. 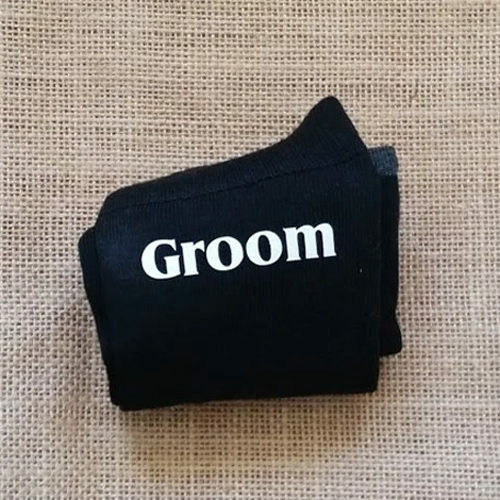 Not only do we have socks for the groom, we have socks for all of the men in the wedding party including the best man, groomsmen, father of the bride and father of the groom. Browse the sock range below. This is one of our favourite pairs of socks we just love preparing for our clients. 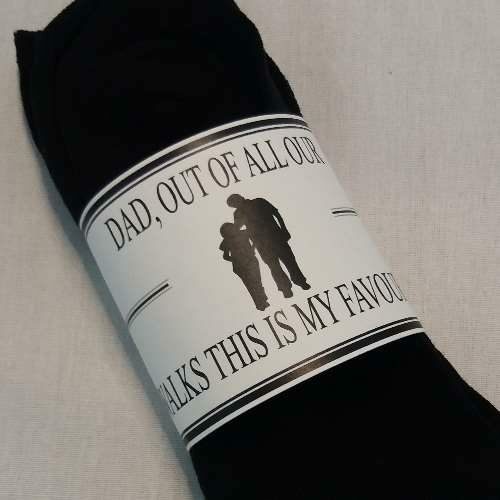 It's a special pair of socks for the Father of the Bride or can be customised (on request) for the person who walks the bride down the aisle. Using the fields below, select from one of the pre-defined options or have your own wording on your choice of wedding socks. Thank you for raising the Man of my Dreams - Socks for Father in Law to Be. 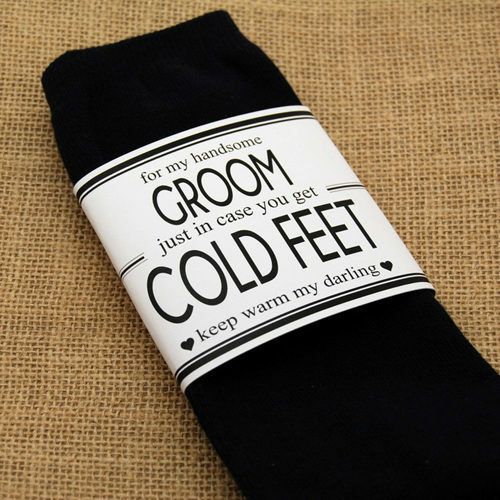 The Groom will not get cold feet and change his mind with these pair of socks! This tongue in cheek pair of socks is a great gift for the upcoming Groom or delivered to his door on the big day as a humorous gesture from the bride. 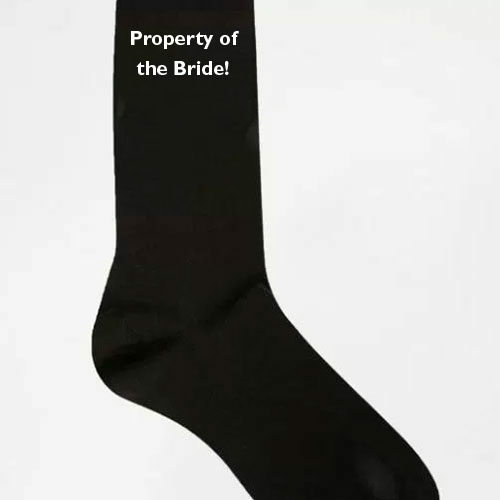 The groom is officially property of the bride, so why not make it official and tell the world with this pair of socks to be worn on the big day. Socks for the groom to wear on his big day to add a little humour to the day and to possibly get the guests chuckling if they catch a glimpse of this pair. 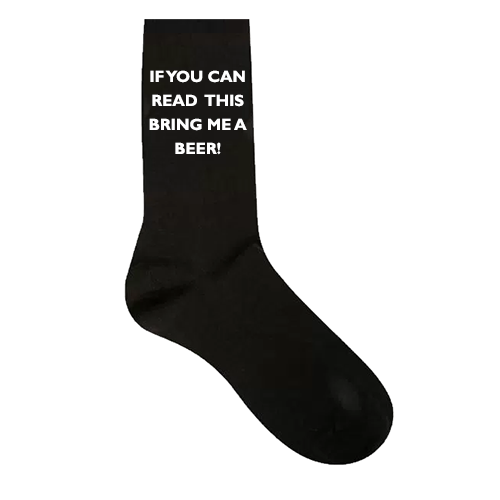 If you can read this, bring me a beer socks. Socks perfect for the groom with a touch of humour to it. 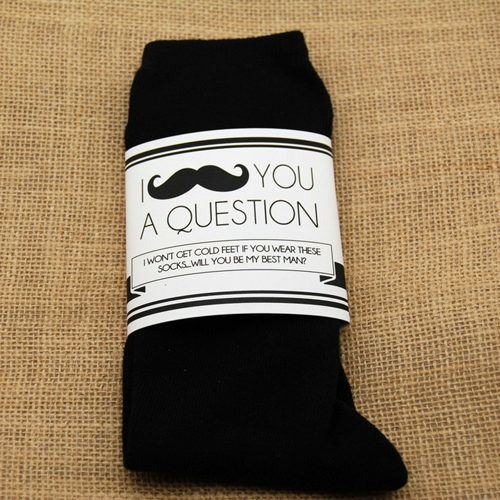 I Moustache You Socks ideal for the groomsmen, best man, master of ceremonies and / or ring bearer. 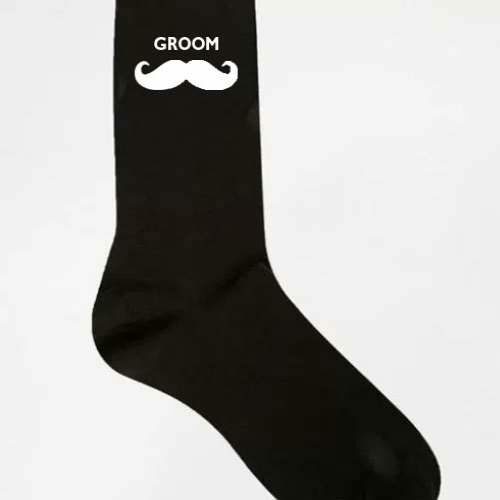 The 'I Moustache You Socks' are a fabulous way of asking your friend / family member to play a certain role in your wedding day. The sock label reads: "I [moustache] YOU A QUESTION I won't get cold feet if you wear these socks...will you be my [YOUR WORD HERE]" The colour of the wording and paper can be customised to your request. Please either email us on team@celebration.co.za or specify in your order's comments the colouring you would like. 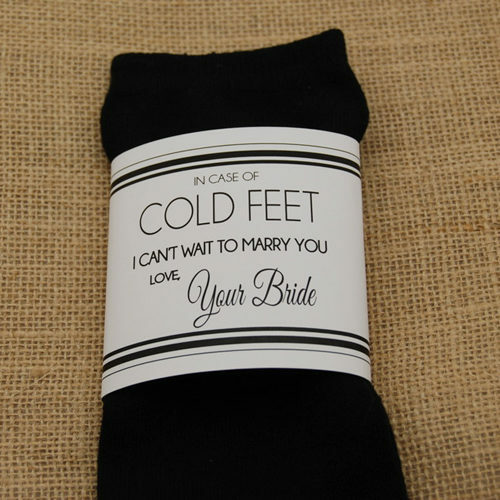 In Case Of Cold Feet Socks are socks wrapped in a label that reads: 'In case of cold feet, I can't wait to marry you. Love Your Bride'. These socks are a great gift for the groom on the big day! © Copyright 2003 - 2019 | All Rights Reserved | Use of images without consent strictly prohibited.